HTC One strays away from the "more is better" megapixel mantra hammered in the customer perceptions, providing what it calls an UltraPixel camera, where the separate pixels are 2 microns, compared to the 1.4 micron buckets for light in the Galaxy S III and the iPhone 5. We snapped a few indoor photos at the MWC expo with the display HTC One unit, and then the same ones with Samsung's and Apple's finest. We won't comment on the quality, as there might still be work to be done on the One before it gets in boxes and onto retail shelves, but you can judge for yourself in the slideshow below. Overall, the HTC One expo unit here snaps with less blur in the indoor lighting conditions, which can be expected given the larger pixel size and optical image stabilization mechanism inside, but let's wait for the final verdict when we get a retail unit, and we also get to compare it with the Lumia 920, which has smaller pixels, but sports a different OIS tech in its chunky unibody. What is clearly noticeable right away, however, is that the output files from the HTC One are two to three times smaller than those from the 8 MP cams on the iPhone 5 and the Galaxy S III. Take a peek at the original shots and videos from the three devices below - they haven't been resized, so will take some time load. So, when is PA going to get a production unit from HTC to test? i love how the GS3 is still compared to every new phone comes out, and still gives it a competition ! GS III is still a relevant phone. It isn't at the top of the hill, but the GS IV is not long from re-taking that position. Not bad for 4MP!!! 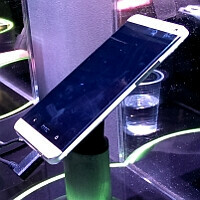 It actually seems that in the "NVIDIA" stand picture, the HTC is better than GS3! Didn't see THAT coming! HTC > GS3 > iPhone5. We want Lumia 920 vs this one ! The 720 vs the One (one sample doesn't quite say much) but HTC needs to work their asses off the deliver after blasting the 808, and not just merely hype anything. Check MyNokiaBlog. Seems like the HTC One is on par with the iPhone 5 or slightly less impressive, but better than the S3, not bad but not great either. It is the result of the "suspension" tech mounted on the HTC camera. Quite similar to the one in Lumia 920, but more simple (less axes). This results in extra exposure with less blur, thus collecting more light. I agree that more & more megapixels on a Tiny sensor chip is a bad idea BUT 4 megapixels is just too small for zooming in, 8 megapixels should be the best on a LARGE sensor chip. not bad for a 4 mp htc. I have absolutely no faith whatsoever in phone arena conducting a fair test using the Lumia 920 as a reference handset. What you'll get are the usual dirty tricks employed by sites like the verge and gizmodo. ie. setting the focal point at some obscure object in the corner, selecting the worst photos of the bunch, using incorrect exposure and iso settings etc..
one picture is very clear and real then iphone 5..iphone 5 has a more saturate but not as good as one in real color. What I'm trying to understand is why the WP fans are going so hard? So what if HTC took a dig at the Nokia cameras? If you're camera is better great, if the One is better, is that gonna make you switch to Android? Probably not. Going nuts over camera comparisons, I'll never understand. I want a phone's camera to take good enough pics for me to share via the web/social media whatever, and I want the phone to be an Android phone. If you want the same thing on a dif OS then so be it. Let's just chill out with the fanaticism already. I really really hope that final unit of HTC one won't skip the frames on video!!! Please HTC, hear that. Thank you. I can see where HTC is going with this. Brighter lens (f2.0) and OIS showed their advantages here. Almost consistently, they result in faster shutter speed and less camera shake. The S3's f2.6 lens is showing its handicap in the fourth set of photos - camera shake. However, I do not see the advantage of the 4mpx sensor. If anyone zoomed into the fourth set of photos, one could see that the hair of the young man playing with the phone is all smeared - no details at all. The iPhone produced the best details here although with a touch more noise.